Can you guess this mystery animal? It’s short and stout with a large, round head, two small eyes and a big, black nose. Its ears are large, round and furry. Its wool-like fur is white and grayish brown. It lives in trees in eastern Australia and eats eucalyptus leaves. Did you guess “koala bear?” Well, you’re half-right. Yes, it’s a koala, but don’t call it a bear! Koalas are marsupials, not bears. Bears and marsupials are not related at all. Our Creator, God, gave all female marsupials belly pouches for carrying their babies. Most marsupials have one baby at a time. When a koala is born, it’s the size of a bee. Blind, hairless and without ears, it looks like a pink jellybean. 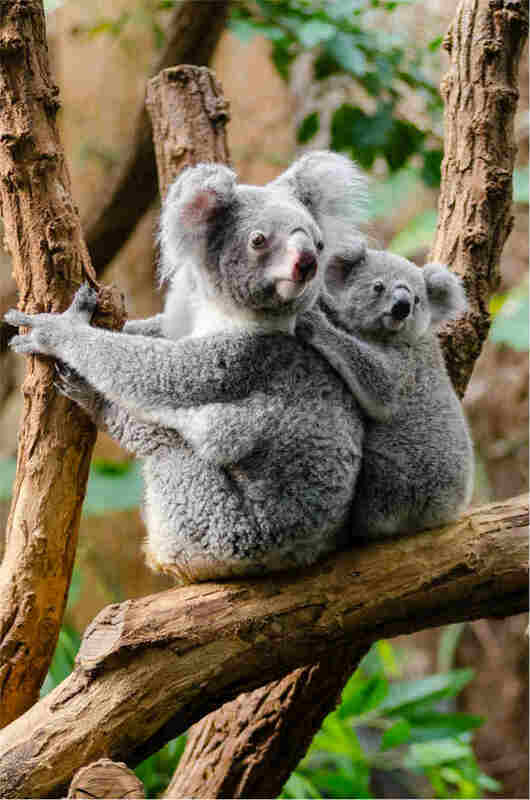 Using its sense of smell and strong arms, baby koala crawls into the mother’s pouch and stays there six to seven months. When the joey outgrows the pouch, it rides on the mother’s back until it’s half grown. Riding helps the joey reach its dinner of eucalyptus leaves. Someday it will weigh up to 20 pounds and be almost two and a half feet tall. The koala, whose name means no drink, seldom drinks water and is a very picky eater. If you invite one for dinner you’ll have to find just the right kind of eucalyptus leaves. Of the more than 600 types of leaves, the koala prefers only two or three kinds. Using its rubbery nose, the koala carefully smells the leaves and only eats its favorite. You’ll need about one pound of these chewy leaves per koala. Another problem will be deciding what time to serve dinner. A male prefers to eat during the day but the female eats only in the middle of the night! These tree-dwellers spend 18 to 20 hours each day sleeping and resting. Scientists once thought something in eucalyptus leaves made koalas so sleepy. Now they know these leaves are so low in vitamins that koalas must save their energy for moving and climbing. Sometimes a koala spends several days in one tree. If cold, it will move and perch in the sun. If hot, it will climb onto a branch in a breezy spot and dangle its legs to cool off. Australian parks don’t need fences around the koalas because they never run off. Koalas can walk and run if necessary but they’re best at climbing. Our wise God gave koalas special paws just for climbing tree trunks and holding onto branches. Each front paw has two thumbs and three fingers, all with long, sharp claws. Each hind paw has five toes. One is big and clawless and two of the remaining four are joined together to work like a comb. The koala uses this comb to clean its fur and get rid of ticks. God made the koala just the way He wanted it to be. Let’s praise God for His wisdom and power. “You are worthy, our Lord and God, to receive glory and honor and power, for you created all things, and by your will they were created and have their being” (Rev. 4:11).